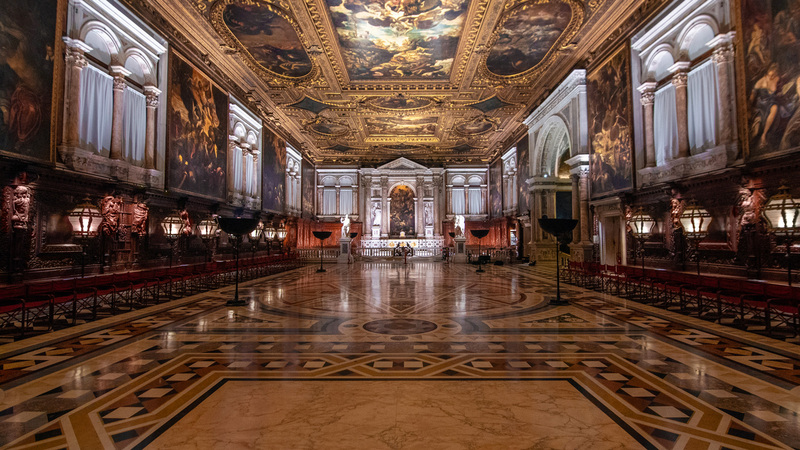 To mark the 500th anniversary of Tintoretto’s birth, the Scuola Grande di San Rocco and iGuzzini - a leading company in the architectural and museum lighting sectors - are unveiling a new lighting system in the Sala Capitolare of the Scuola Grande di San Rocco. The project has been created using intelligent lighting solutions manufactured by iGuzzini, technical sponsor for the installation. It is designed by the architect and lighting designer Alberto Pasetti Bombardella who specialises in illuminating works of art and has decades of experience working in the cultural heritage sector. The Sala Capitolare houses Tintoretto’s grand artistic and iconographic project which consists of thirty-three paintings with scenes from the Old Testament on the ceiling and scenes from the New Testament on the walls. The vast paintings on both the ceilings and the walls are bound together in a single, grandiose project based on two artistic cycles. On the one hand, the new lighting project restores the chromatic and figurative uniqueness of these artworks by improving the visitor’s experience through innovative forms of interpretation (created by differentiated lighting scenes), while on the other, it enhances the hall’s decorations and architecture. “Through this project, iGuzzini has once again demonstrated its ability to incorporate technology into an environment of invaluable historic and artistic worth. The decision to create smart, custom-built solutions for Tintoretto’s great masterpieces and to use special LEDs and optics to enhance the artist’s choices of light and colour exalts the emotional and theatrical appeal of these paintings and improves the visitor’s experience through a real ‘perceptive restoration’. In fact, iGuzzini’s lighting is, first and foremost, a social innovation tool” commented Adolfo Guzzini, the President of iGuzzini illuminazione. After the new lighting systems designed for Leonardo’s The Last Supper (2015), Giotto’s frescoes in the Scrovegni Chapel in Padua (2017) and Michelangelo’s Pietà in St. Peter’s Basilica (2018), iGuzzini continues its commitment to enhancing world cultural heritage, through the Light is Back programme, by illuminating the masterpieces of another great artist. 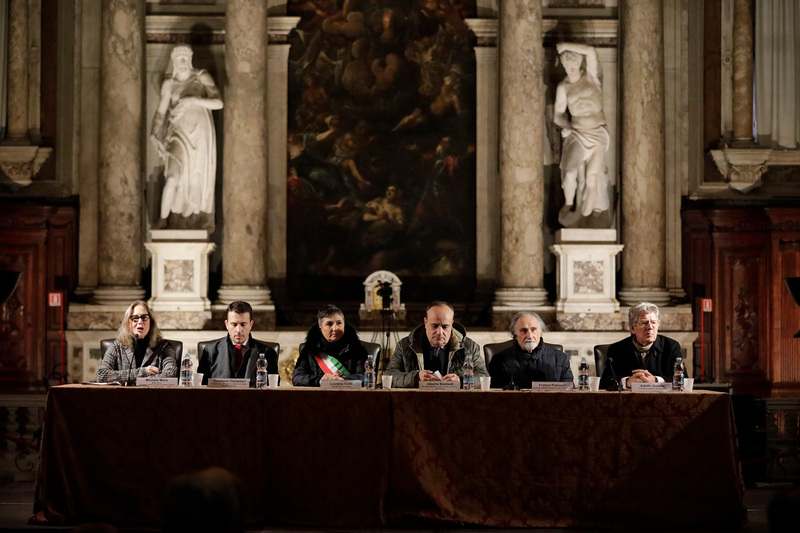 A new project has therefore been signed with the Confraternity of San Rocco in which iGuzzini agrees to put forward technical improvements in the years to come to help adapt the existing system to future technological developments. The new lighting system offers visitors an overall vision of the hall while also highlighting the details of the individual artworks. Moreover, all the iGuzzini solutions guarantee maximum energy efficiency and blend into the hall’s architecture and decorative features through minimal visual impact. The light is managed and controlled by an iGuzzini digital system using DALI protocol that allows adjusting the light intensity of both individual luminaires and those grouped for homogeneously illuminated areas, and differentiated activations that allow for different interpretations of the artworks and decorative motifs. Alberto Bonisoli, Minister of Cultural Heritage and Activities, Franco Posocco, Guardian Grando of Scuola Grande di San Rocco, Luciana Colle, Vice-Mayor of Venice, Cristiano Corazzari, District Councillor of Culture and Safety for the Veneto Region, and Adolfo Guzzini, President of iGuzzini illuminazione, took part in the press conference. Demetrio Sonaglioni, Vicario Scuola Grande di San Rocco and Alberto Pasetti Bombardella, lighting designer, presented the lighting project. The event was moderated by Michela Moro, journalist and cultural programmes author. In Venice, in addition to the lighting project at the Scuola Grande di San Rocco, iGuzzini is also contributing to the implementation of the artistic installation “Art Light Flags” by Mario Arlati promoted by the Piazza San Marco Association in collaboration with the Galleria Contini and Vela S.p.a. As from tonight, the bell tower of San Marco, a symbol of Venice par excellence, will be illuminated by the coloured flags of the talented contemporary artist.